In the 1950s, helicopters were still a relatively new sight around Newfoundland and Labrador. The first helicopter rescue in Newfoundland was in 1946 with the rescue of the survivors from the crash of Sabena OOCBG near Gander. In 1953, helicopters were much more reliable and safer, but their use in any sort of rescue operation, like today, makes for an exciting and dramatic story. This past spring the island saw a lot of pack ice. Middle Cove and Outer Cove became popular destinations for folks who wanted to see the ice, and some who decided to go out on the ice. In 1953, William Dunn of Tunis Court in St. John’s, took to the ice with two unnamed companions to hunt seals. When Dunn didn’t return that evening, a search started. His brother, John Dunn, set off at 5am on Saturday, March 29 from Logy Bay, and within an hour was marooned by slob ice about 150 yards offshore. Ice at Middle Cove Beach this past spring. Photo from bitstop-nfld. At the same time that John Dunn was leaving to try to find his brother, the Royal Canadian Mounted Police (RCMP), the Royal Canadian Air Force (RCAF) Rescue Unit, the United States Air Force (USAF) and Coast Guard were putting a search and rescue plan into motion. Flight Lieutenant Ensom of the 103rd Rescue Unit Detachment of the RCAF at Torbay, was contacted by the RCMP to help rescue a man stranded on the ice near Logy Bay. Ensom checked the weather and determined that it was too poor to attempt to fly a Canso to the area. A while later, Major Rich, Operations Officer of the 6th Air Rescue Unit at Fort Pepperrell offered his assistance. He had gotten the story from other sources. Ensom passed on the offer to Inspector Porter of the RCMP who said there were now others caught on the ice in the same area. By 11am, the weather was still too poor for the Cansos, so Ensom contacted Rich who ordered a helicopter from Harmon Air Force Base in Stephenville. Added to the order was a line-throwing rifle from the US Coast Guard in Argentia. 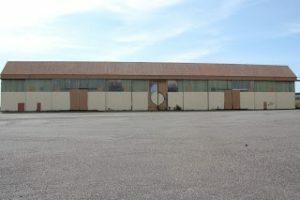 One of the buildings left in Stephenville from the Harmon Field days. Photo by Shannon K. Green, 2013. All of the equipment arrived by 2pm and a rescue party was formed to rescue John Dunn. The crew consisted of Porter, Ensom, two RCAF Para-Rescue personnel, Trent and Courtourier (who had parachuted to the B-36 crash in Burgoyne’s Cove), Lieutenant Carmichael of the Coast Guard and a Navy seaman who could use the line-throwing equipment. While this was happening, fishermen from Logy Bay determined that there was too much ice and the swells were too high to put out dories to reach John Dunn. Instead, Pat Malone, a veteran sealer, lead Frank, Dan and Coleman Cadigan’s efforts to rescue Dunn. The fishermen used a system of planks, gaffs, and ropes to reach from pan to pan and guided Dunn to the shore. John was just making it to the shore as the large rescue team arrived in Logy Bay. The rescue crew and John Dunn. From left corner clockwise: Dan Cadigan, John Dunn, Paddy Malone, Uncle James, Tim Malone, Willie Cadigan, Francis Cadigan. From The Daily News, 30 March 1953, p.1. (note the caption reads Jack Dunn, but the article in The Daily News and The Evening Telegram say John Dunn). 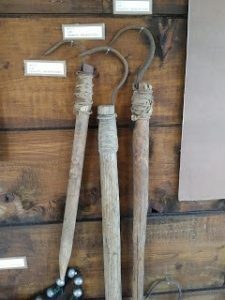 Gaffs in the Logy Bay-Middle Cove-Outer Cove Museum. One was donated by Francis Cadigan, could it have been used in this rescue? 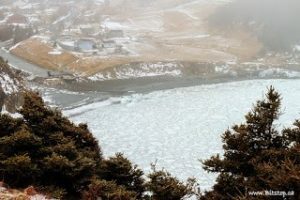 While these rescue efforts were going on, the RCMP received word that another sealer, Frank Olson, was stranded off Sugar Loaf Rock, off Small Point, about two miles south of Logy Bay. RCMP and civilians had tried reaching Olson with a line, but to no avail. At one point, Olson caught the line, but dropped it in the water where it was immediately caked in ice and broke. At 6:15, the helicopter arrived piloted by Captain Wills of the 52nd Air Rescue Squadron. Wills picked up Enson, who showed him where Olson was located. The helicopter hovered over Olson and lowered a harness. Olson fitted the harness under his arms and was lifted off the ice and hauled on board the helicopter. He was then let off at Small Point where the RCMP took care of him. The helicopter then left to search for William Dunn. 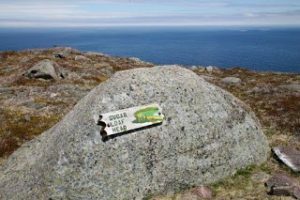 Sugarloaf Path, part of the East Coast Trail, takes hikers past Sugar Loaf Rock and Small Point. From Hiking the East Coast Trail (and Beyond). By 7:15, the weather was poor again. While it was nice on shore, the ice was shrouded in fog and made it unsafe. The Evening Telegram reported that, weather permitting, the search would resume the following day and the helicopter search would be joined by at least one Canso from Torbay. Further research is needed to see if William Dunn was found. 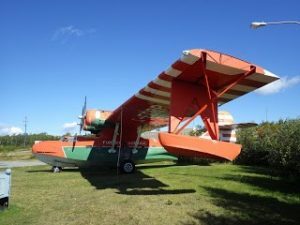 The Canso outside the North Atlantic Aviation Museum in Gander. Photo by Lisa M. Daly, 2013. ‘Tell them,’ F.Lt. 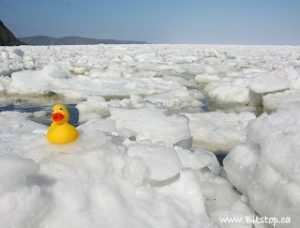 Ensom said, ‘that they are completely on their own when they go out on the ice.’ –The Evening Telegram, 30 March 1953. 1953 Back from the Rescue. The Daily News, 30 March 1953, p1. 1953 ‘Copter Pulls Man to Safety. The Evening Telegram, 30 March 1953, p.1. 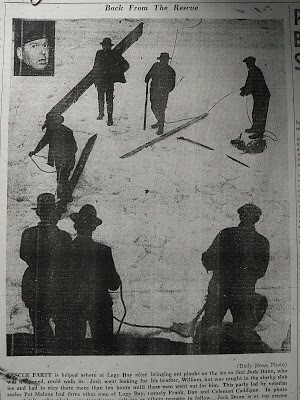 1953 Two Men Rescued From Ice; Third is Still Missing. The Daily News, 30 March 1953, p.3. I spent this past summer working at the Logy Bay-Middle Cove-Outer Cove Museum, and it is part of why I didn’t get to post much this summer. Between that and tours, I didn’t have time to do proper research, but did collect a bit of interesting information that once September settles down (no more museum work, but lots of tours) I will share more of it. For now, here is a quick excerpt from one of the Senior Interviews located in the Logy Bay-Middle Cove-Outer Cove Museum archives. These will soon be up on the MUN Digital Archives, and hopefully next year more interviews, especially those about the Red Cliff Radar Station, will be up on the archives. They will be available again for anyone who wants to read them when the museum opens again next summer. This summer I have been working at the Logy Bay-Middle Cove-Outer Cove Museum as one of my three jobs. It’s been a busy summer, and I have not been keeping up on my blog posts. This quick post came to mind as in the same day that I read the following interview with Mrs. Mary Boland, long-time resident of LBMCOC, former MHA Tom Hickey came to the museum and mentioned the Hindenburg passing over the area. The following is from the transcript of an interview with Mrs. Boland that is housed in the museum collection. The Hindenburg seen from the South Side Hills in St. John’s. From the George Story Collection. Now, I remember you telling me one time about that big blimp. Yeah, the Hindenburg, the one that came over from Germany. That’s the one that caught fire in the States. Now, that went right up though Outer Cove, didn’t it? That went right up, came up from the Flatrock beamer, that way, come up that way and it was just floating along. There was no sound or any kind of noise out of it and it kept on going up right slow, and it kept right in the bay and it went right on up over the big river, that way. And it kept on going right out and it was going right slow. ‘Twas just like a big bomb. That was the name of it, the Hindenburg. What did the crowd think of that? Oh my God, everyone thought there was a war on or something, because you had no radio or anything, and you wouldn’t know unless you’d be in Town and get the paper and get any news out of it. And there was no radio or TV. Moor Mrs. Whelan, they had a garden there by that wall there on the corner and I was out in the yard watchin’ it and she beckoned to me to go down to her and she said: “What is it? Did you hear anything? Did you see that thing going up like a big balloon?” And I said: “Yes, we don’t know what it was.” There was no noise to it. She said: “Tis not like a plane and there was no wings or nothing on it, ‘twas just like a big bomb.” “My God” she said “I suppose they’re not going to blow us up.” Poor old thing, she was frightened to death. And the next day then, someone was in Town and got the paper, some of the milkmen, Pines or someone, and they said ‘twas a German modern-type plane. They said it was one of a kind and they were doing some kind of experiment on it. It said then, in the paper, they phoned the Head office in Germany or England, or somewhere, and they said they were testing it to see what endurance it would have, going with no wings or anything, just a motor. Any idea when that was? I think it would be about 1937 or 1936, mid-thirties. Is that the same on that blew up? Yes, it went from here across to Canada and into the States. ‘Twas some place in the States, it blew up. Yeah, New Jersey or some place like that. Anyway that was the excitement for that day. Yeah, it was a really exciting time. The Hindenburg over Newfoundland, possibly over Logy Bay-Middle Cove-Outer Cove. From the Logy Bay-Middle Cove-Outer Cove Museum Collection. Mrs. Boland’s interview shows how isolated many areas of the island were, even those who were within a day’s travel to St. John’s. While in St. John’s there might have been warning, and perhaps the German flag had been flying on Cabot Town, many other communities who did not have radios would have to wait until the newspaper arrived or someone came back from St. John’s (Town) to share the news. As can be seen with Mrs. Boland’s account, sometimes that news wasn’t always accurate. The Hindenburg was not the first such ship to fly over Newfoundland, although it was the largest (Deal 2012). 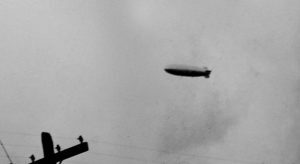 The Graf Zeppelin and the R-34 were two other dirigibles who flew over Newfoundland, and a number of blimps visited Newfoundland as well. Mrs. Boland, at Mr. Boland’s leading questions, is not clear if she remembers that the Hindenburg crashed that same trip, or if she just remembers that it is the same aircraft. Like many, Mr. Boland may not have been aware that the Hindenburg flew over Newfoundland 13 times, and Mrs. Boland may not be remembering that last trip. If it were indeed an experimental flight (unlikely seeing as the Graf Zeppelin made an earlier passenger flight across the Atlantic in 1928) that would make it an early, 1936 flight, not the final ill-fated flight in 1937. Research done by Dr. Deal of Memorial University (2012) indicates that the first time the Hindenburg passed over the Avalon Peninsula in July 1936, but in that case it did not go as far east as Outer Cove, but rather left by flying over Signal Hill in St. John’s. 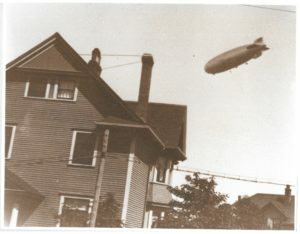 Most likely Mrs. Boland and Mr. Hickey were recalling the September 1936 flight of the Hindenburg when on the 19th of that month the dirigible came in from Cuckhold’s Cove (or perhaps Outer Cove which is relatively close) before flying over St. John’s and Conception Bay. The final flight in 1937 only passed by the southern tip of the island, where survivors recounted seeing ice bergs off the coast of Cape Race. Discrepancies are certainly to be expected. Mrs. Boland would have been around 16 when the Hindenburg passed over, and amazingly, Mr. Hickey would only have been 3 or 4 years old at the time. Even if other blimps and dirigibles had passed over Newfoundland, the Hindenburg was such a spectacular sight that it stayed in the minds of many, no matter how young or old. 2000 Interview with Mary Boland, Senior Interviews. On file at the Museum of Logy Bay-Middle Cove-Outer Cove. 2012 Airships over Newfoundland. Canadian Aviation Historical Society Journal, 50(1): 14-24.